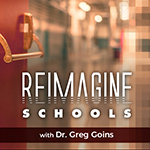 In this episode, Ken Kay, CEO of EdLeader21, challenges school districts across the nation to develop a personalized Portrait of a Graduate that will serve as a collective vision that articulates a community of stakeholders for school transformation. Kay, co-author of The Leader’s Guide to 21st Century Education: 7 Steps for Schools and Districts, shares insights on the work of EdLeader21 and its recent collaboration with Battelle For Kids, a national not-for-profit organization committed to collaborating with school systems and communities to realize the power and promise of 21st century learning for every student. Together, EdLeader21 and Battelle For Kids, have joined forces behind a shared goal that: By 2021, 21 percent of the school systems in the United States are engaging their communities to develop and implement a Portrait of a Graduate. Twitter: @KenKay21. Websites: https://ift.tt/2JmoCCV; www.edleader21.org, www.battelleforkids.org.